A Tale Of The Greats - New Works by Amar Stewart. Here are the details for my solo show in SF this coming August. The show is a continuation of my HipHop Royalty show back in March. The icons I chose to paint are artists that have influenced me growing up and continue to do so today. I will post up an event page soon. Hope to see all my SF crew there! ABC 7 covered the story. THEFT AT AMAR STEWART DUBUT SOLO SHOW IN NYC. We woke up the day after to find the story in The New York Post. The moment after the chase had ended and the Basquait painting was retrieved. After my month long residency at The Cotton Candy Machine we held a closing party to celebrate the new works. About 2 hours into the show 3 paintings of mine that were stored in the back room were stolen. 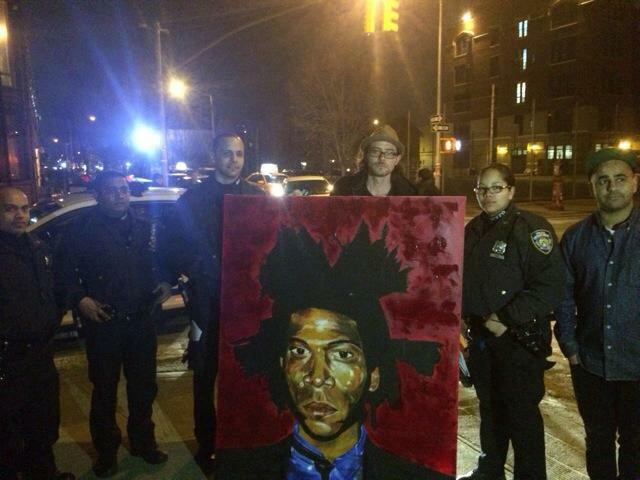 A 5 ft portrait of Basquiat, a 4ft painting of Nelson Mandela and a Snoop painting. These pieces were from a previous collection that were displayed earlier in the month, this is why they were stored in the back. Sean Leonard, owner of The Cotton Candy Machine noticed they were missing and ran out in search of the thieves. The works had been taken out of the fire escape. After running around the streets he found one guy with the Basquait painting and ran after him with the huge portrait after it was retrieved. One man has been arrested but 2 paintings are still missing. Within 24 hours pretty much every news station caught wind of the story and it went National. You can check out all of the coverage below. Thanks to everyone at The Cotton Candy Machine and thank you to Sean Leonard and Tara McPherson for inviting me to show my work. I recently got asked to create a piece of world famous hip-hop producer J-Dilla. I also released a limited run of prints where I will contribute 25% of proceeds to the J-Dilla foundation. They are available HERE.